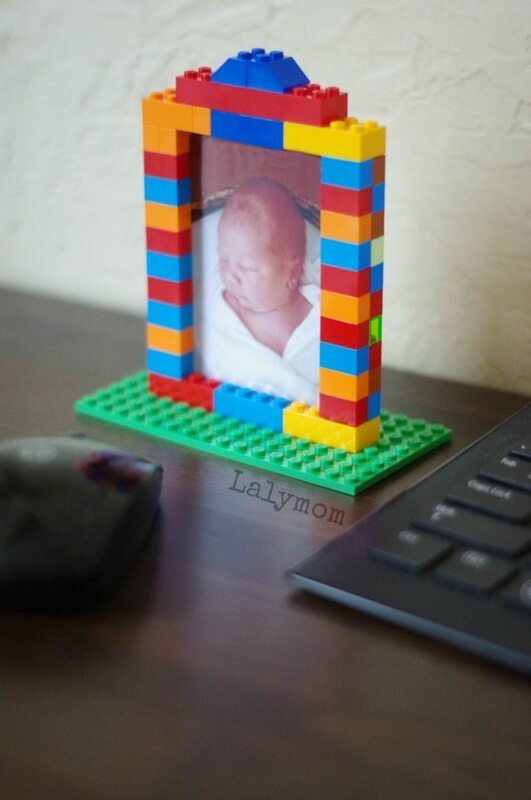 I've got a great tutorial for how to make DIY LEGO Picture Frames. One would be a great Mother's Day Gift but you could change the words to make it say whatever you want! The other is pretty basic, and you could make it for any time! 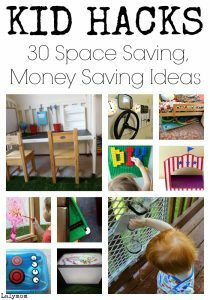 Just a note, affiliate links are included in this post. 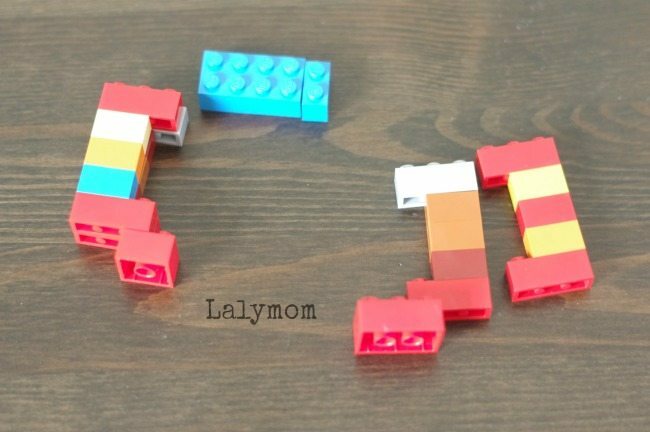 These super cute, simple LEGO picture frames took a lot of trial and error. They also took a bit of patience, but since I did all the hard work for you it will go much quicker for you! 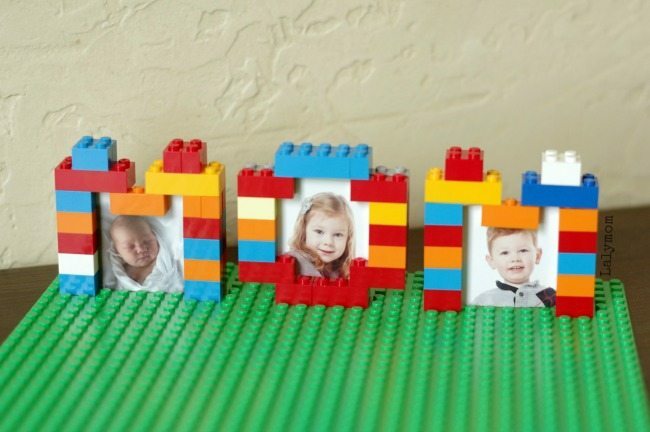 If you are buying a LEGO set specifically to make these, we have this cottage set and this basic set and used pretty much all available 1×2 bricks to make the MOM frame. The other one also requires a lot of size 1×2 bricks but can be made any size you want. 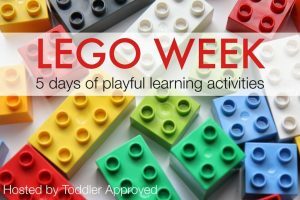 If you're looking for even more LEGO building inspiration, make sure to check out The Unofficial Guide for Learning with LEGO. It's pretty awesome, if I do say so myself. 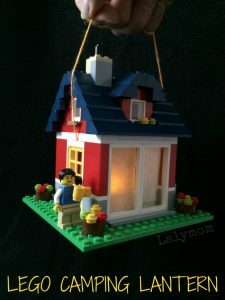 We used bricks from the LEGO Creator Cottage Set and the LEGO Medium Classic basic set. To make both Ms you need to make 8 pillars of 1×2 bricks, with 5 bricks each. 4 of them will be the fronts of the Ms and 4 will be the back, so choose your colors for 4 of them accordingly. 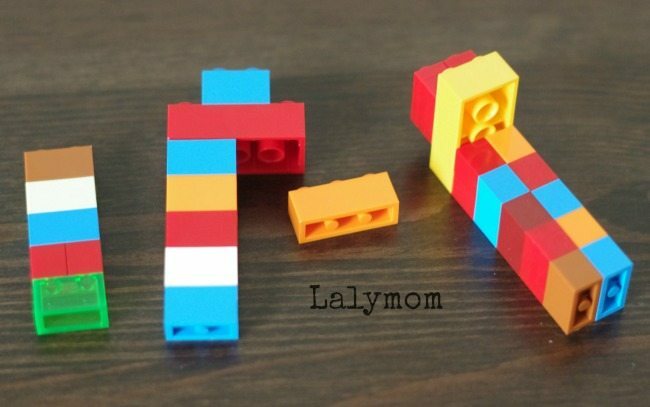 Press them into your base plates, 2 next to each other to form the vertical lines of the Ms. You will leave 5 studs between the vertical lines for each M. Connect the vertical lines with 2×4 bricks on either side, and one 1×3 in the very center (the orange pieces right in the center). The 2×2 bricks on the top are just to make it look more like an M.
To make the O, make four pillars of 1×2 bricks that are each 3 bricks tall. Add 1×3 bricks on the tops and bottoms of each of those pillars. 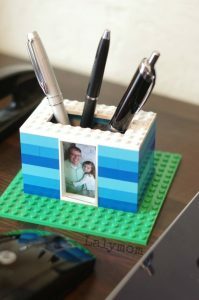 Attach a 1×2 and 2×4 brick to the base plate where you want the O. (In the photo I used a 2×3 and a 2×2, you can do either). Next attach two of those pillars to each side, only on the studs that stick out from the pillars. Cap the O with another 1×2 and 2×4 (or 2×2 and 2×3) and you are all done. 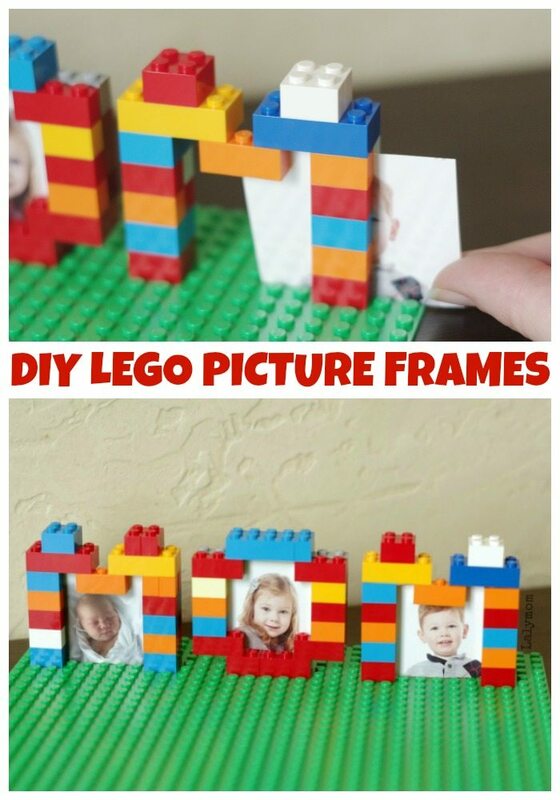 To trim your pictures, be sure to cut them exactly as tall as the opening but wide enough to be held in place by the pillars of LEGO. You can either slide the photos in the slots or remove the tops and add them that way. This one is super straight forward. 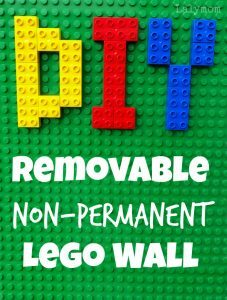 I won't give brick counts because you can make them any size you want! Basically make 4 pillars of 1×2 bricks that are as tall as your photo. Lay down a base of 2×4 or 2×2 bricks that are as wide as your frame needs to be. (Keep in mind a 1/4 inch on the left and right side of your photo will be covered by the frame. The top and bottom are not covered.) Add 2 pillars on each side, then cap as best you can with 2×4 or larger bricks, using more bricks on top if you need to bridge a larger span. 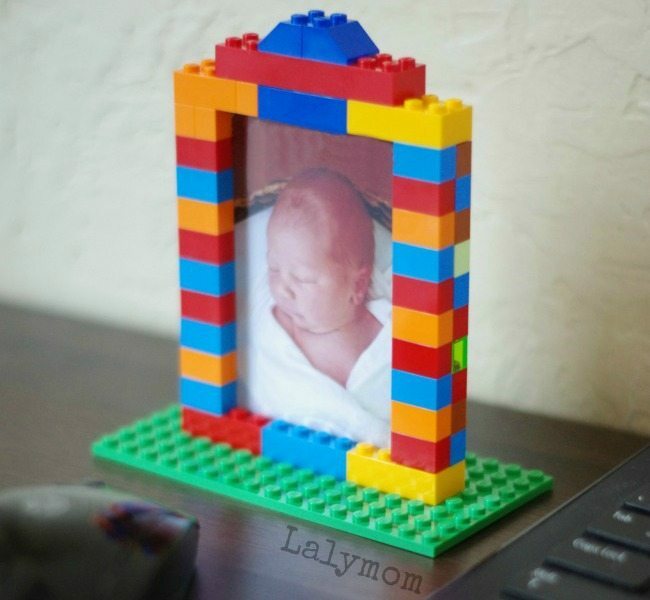 Who do you know that would love these LEGO Picture Frames?! Let's hear it in the comments. 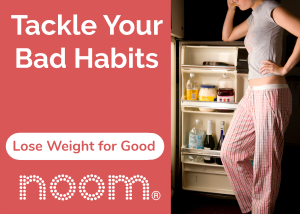 Remember to pin and share this if you like it! Also stick around to see all the other ideas below! 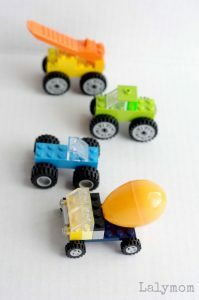 Be sure to hop over to the 2nd Annual Toddler Approved LEGO Week page to see even more ideas. 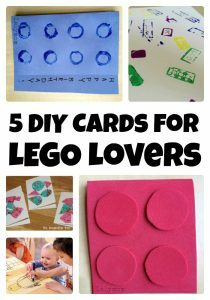 Grab The Unofficial Guide to Learning with LEGO for more inspiration, too! 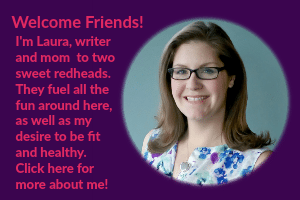 Laura, you never cease to amaze me! This is so awesome! Where were you when my kids were little?